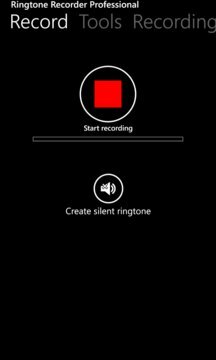 Ringtone Recorder allows you to record new ringtones for your mobile phone. Just let somebody speak into the microphone, record it and save the recording as a new ringtone. There is also a button to create a silent ringtone. 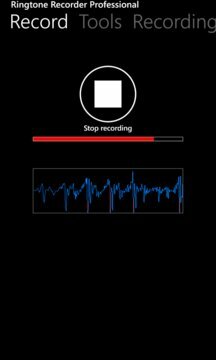 You can record ringtones up to 120 seconds in length. An oscilloscope displays a potential audio signal overload. After recording you can adjust the volume and apply an audio equalizer or a modifiable echo effect. The current recording is saved and can be edited respectively converted later. A start screen icon editor lets you create a customized or transparent tile.